This is a diminutive patronymic form of the personal name Hugh, meaning "son of (little) Hugh", which was introduced into Britain by the Normans after the Conquest of 1066, and was in origin a short form of various compound Germanic names with the first element "hug" meaning heart, mind or spirit. It was a very popular personal name among the Normans, partly due to the fame of St. Hugh of Lincoln (1140 - 1200). A second possible derivation for the name Hewett is topographical, and denoted someone who lived in a newly made clearing in a wood from the Olde English pre 7th Century "hiewet", Middle English "hewett". One William Heuet appeared in the Assize Court Rolls of Shropshire in 1221, while Roger Hughet appeared in the Assize Court Rolls of Somerset in 1280. The Subsidy Rolls of Sussex records a Ricot Huot in 1327. Sir George Hewett (1750 - 1840) was an adjutant-general in Ireland from 1793 - 1799, becoming major-general in 1796. He rose to the rank of general, having been commander-in-chief in the East Indies from 1807 - 1811, and was created a baronet in 1818. Sir William N.W. Hewett was one of the first recipients of the Victoria Cross in 1857, and attained the rank of vice-admiral in 1884 after a distinguished naval career. 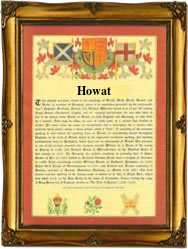 Variations of the surname include Hewat, Hewit, Huet, and many more. The first recorded spelling of the family name is shown to be that of Roger Huet, which was dated 1182 in the "Pipe Rolls of Devonshire", during the reign of King Henry 11, known as "The Builder of Churches" 1154 - 1189. Surnames became necessary when governments introduced personal taxation. In England this was known as Poll Tax. Throughout the centuries, surnames in every country have continued to "develop" often leading to astonishing variants of the original spelling.